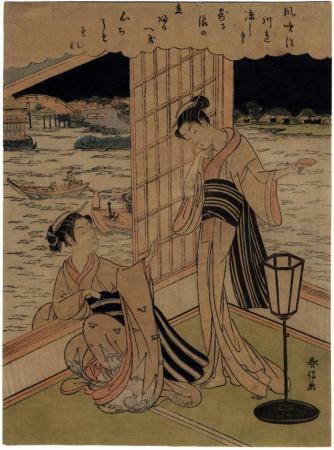 Harunobu produced a series of prints illustrating the Sanjūrokkasen or '36 Immortals of Poetry'. Is this one of them? We don't know yet, but hope to find out soon. There are quite a few from this series in the Museum of Fine Arts in Boston, but not this one. Professor David Waterhouse has written extensively about this series in his incredible two volume set, The Harunobu Decade, cataloging the spectacular collection of Harunobu prints in that museum. The curatorial files of the British Museum say of these poems, in general, and not specifically directed at Harunobu's series: "The 'Thirty-Six Immortals of Poetry' is the canonical list of famous exponents of native waka poetry, compiled by the courtier Fujiwara no Kinto (996-1041) in the mid-Heian Period."